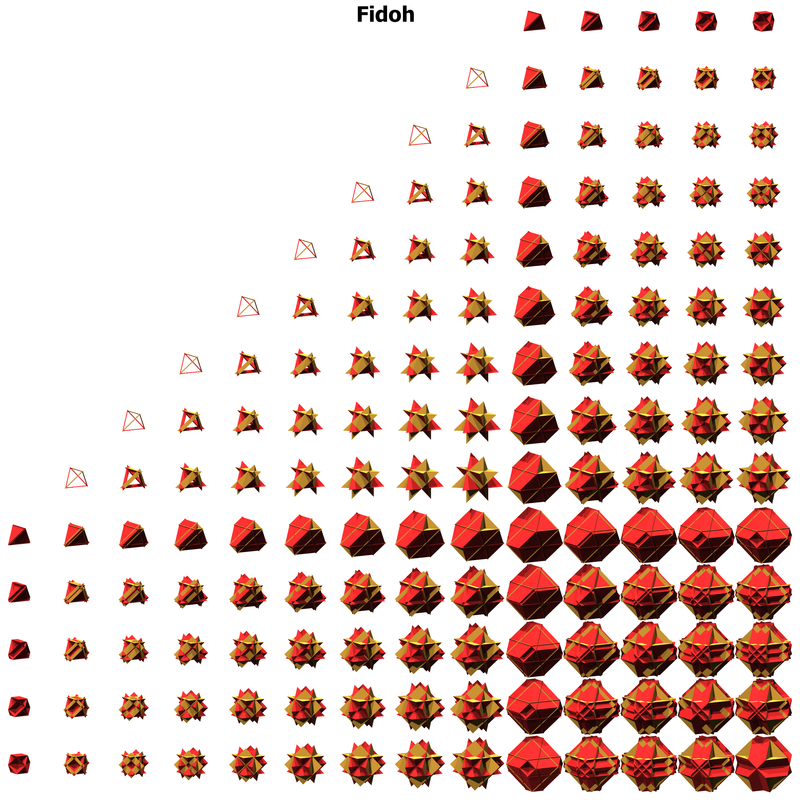 Lately, I've been rendering 2-D fields of 3-D sections of many of the uniform polytera (5-D versions of polyhedra). 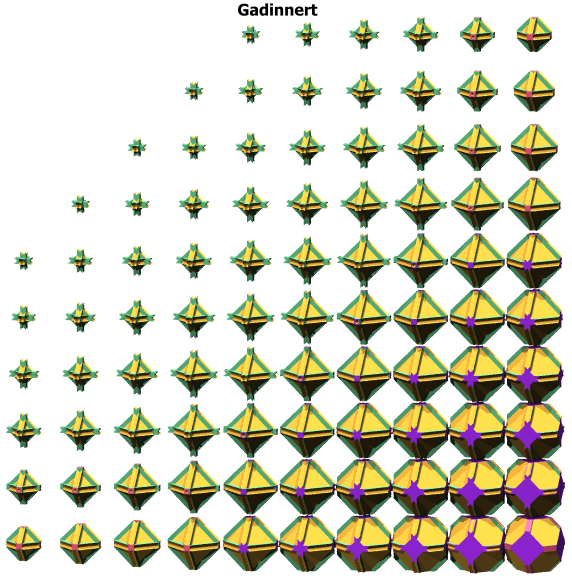 I recently hit an interesting milestone - all of the main regiments (those with hexateric (hixic), penteractic (pentic), and demipenteractic (hinnic) symmetry) has at least one member rendered in sections - I've also rendered all known uniform polytera in regiments with hixic and hinnic symmetries. That means it's time to reveal the uniform polytera in cross sections, so I decided to make a polyteron of the day website. 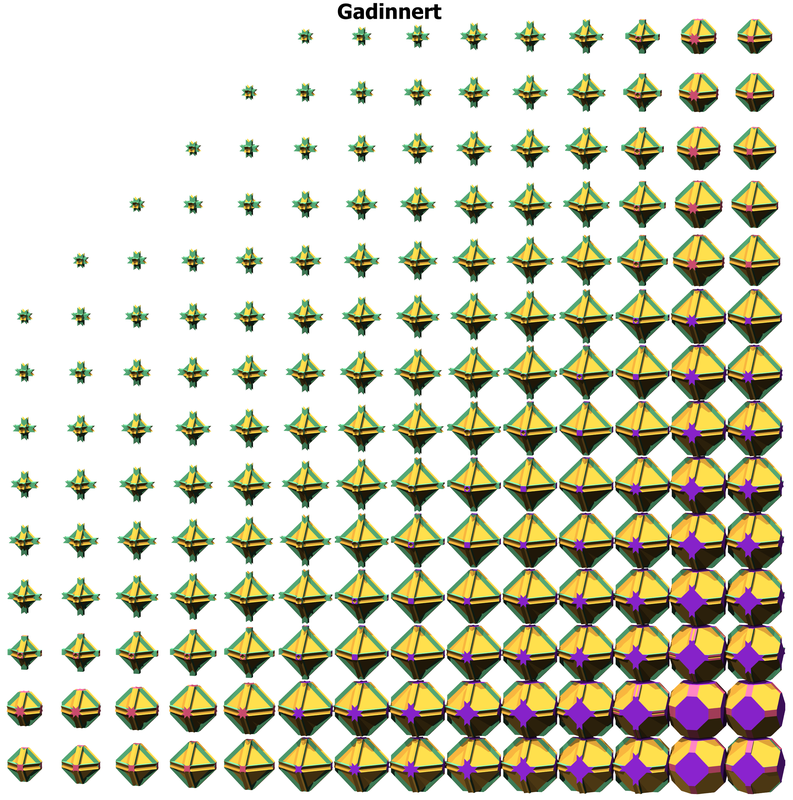 Pictured will be the verf and a field of cross sections of each polyteron. 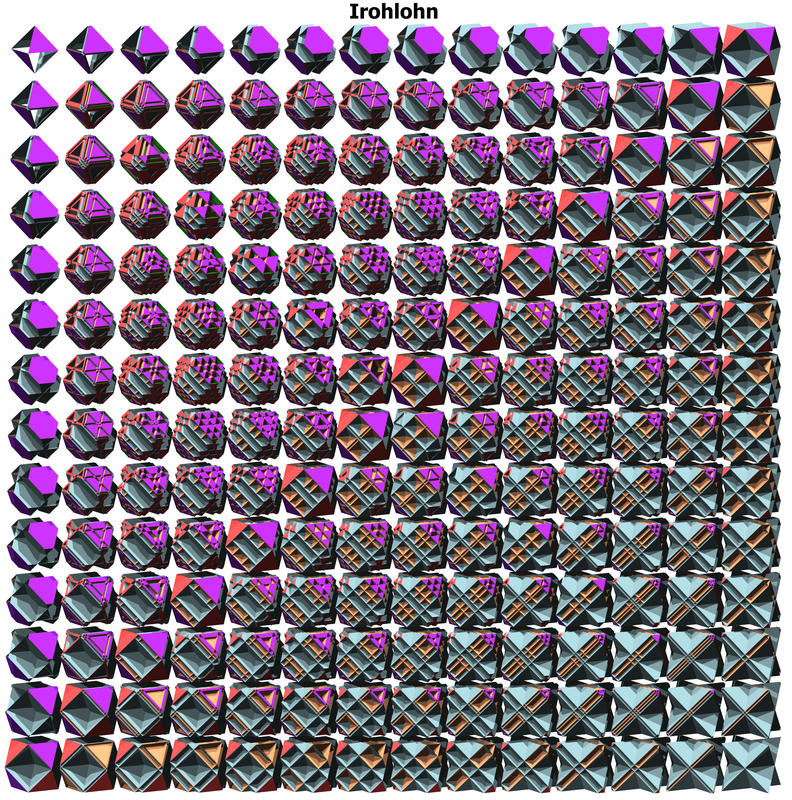 Click on the field of sections for a much larger picture with many more sections rendered at a much larger size. Polytera released in September has been moved to here. 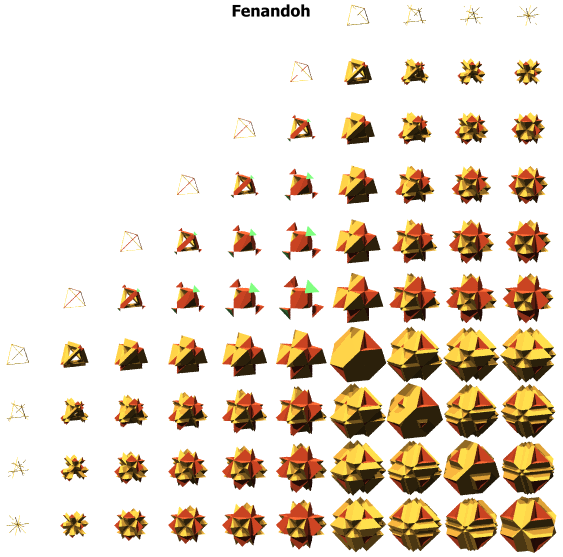 Dec. 31, 2013 part 3 - Fenandoh - Aka - facetospinopenteractidishexadecateron. It is in the siphin regiment. 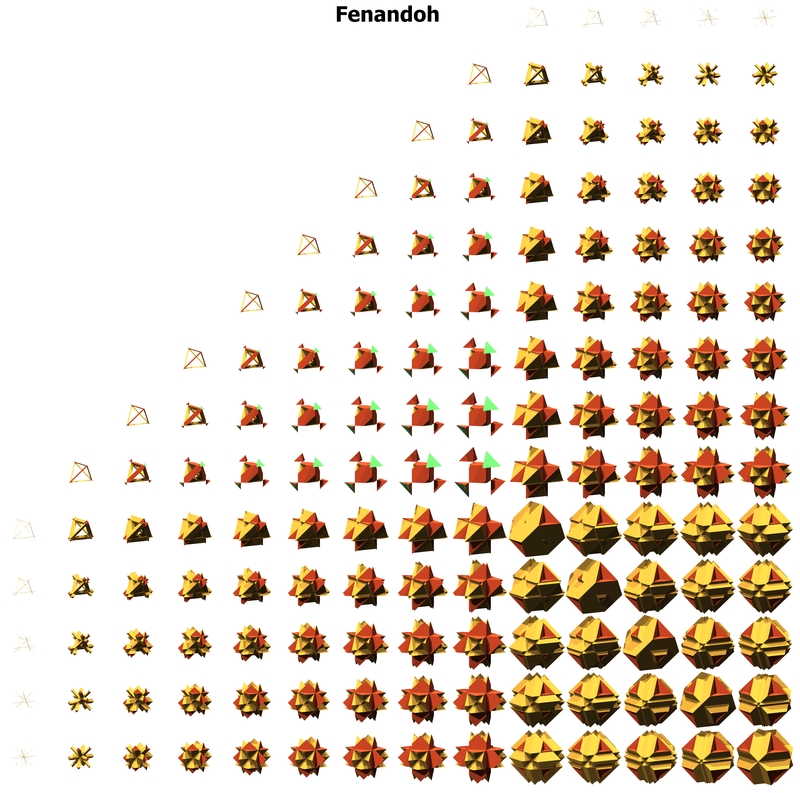 Its facets are 10 gottoes (red-orange), 16 garpops (gold), and 16 pens (green). Dec. 31, 2013 part 2 - Fidoh - Aka - facetoinverted decahexadecateron. 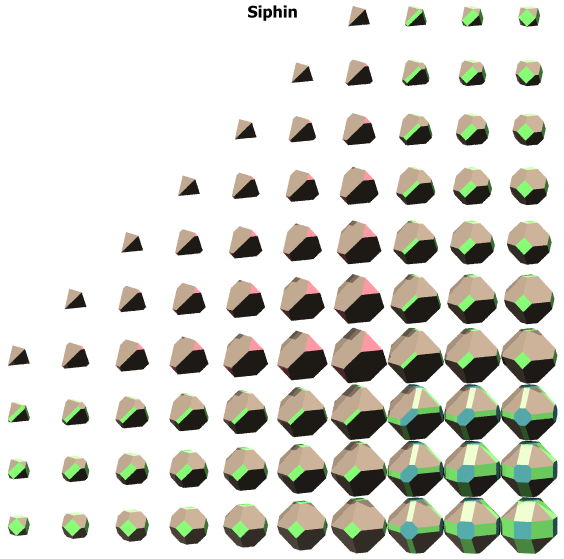 It is in the siphin regiment. 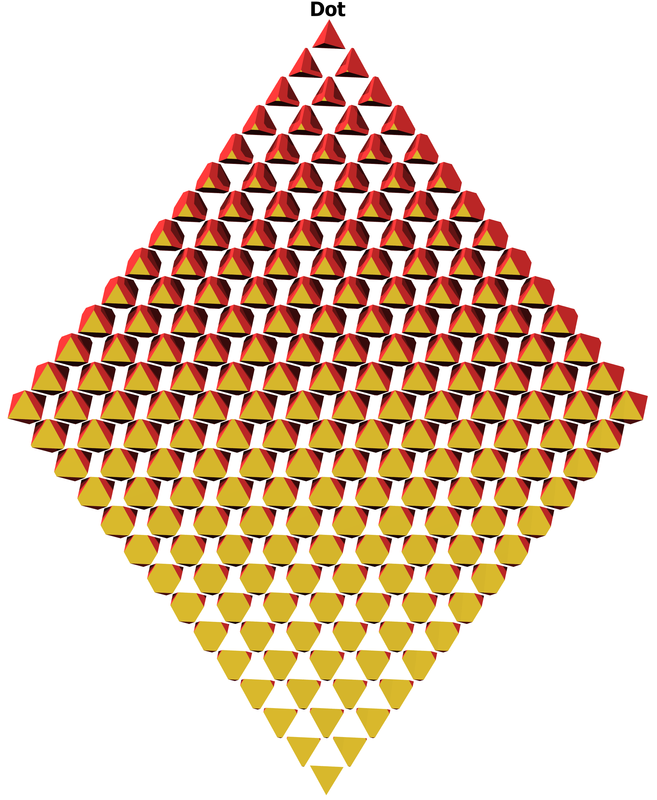 Its facets are 10 hinnits (gold), and 16 pippindips (red). 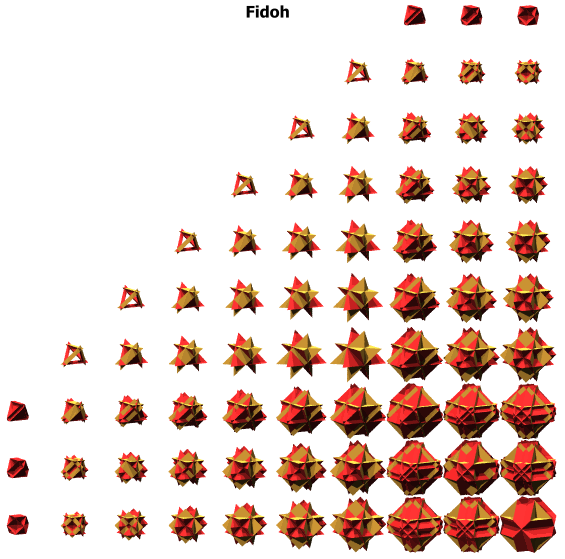 An interesting fact about fidoh is that there is a noble uniform polypeton (6-D uniform polytope with only one type of facet) in the trim regiment (trim is xo8ox) that has 54 fidohs as its facets, there are actually 5 nobles in the trim regiment! 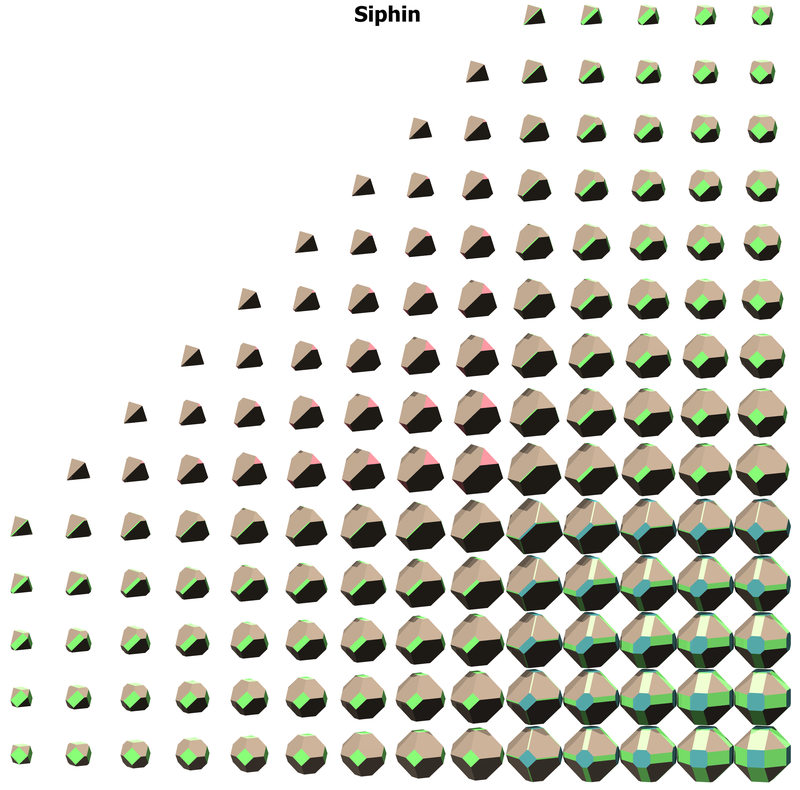 Dec. 31, 2013 part 1 - Siphin - Aka - small prismated demipenteract. Its symbol is xo8x and its regiment has 56 members plus 20 fissaries. 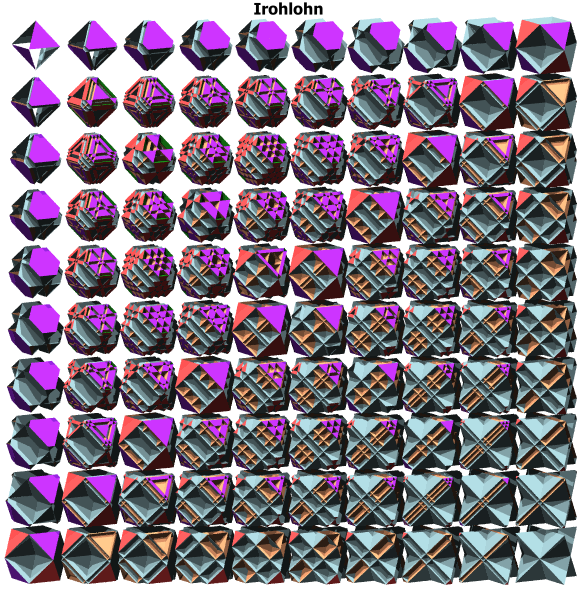 Its facets are 10 hexes (blue), 16 pens (pink), 16 spids (light wood), and 40 tepes (light green). Dec. 24, 2013 - Irohlohn - Aka - invertiretro16lepidohemipenteract. It's in the nit regiment. 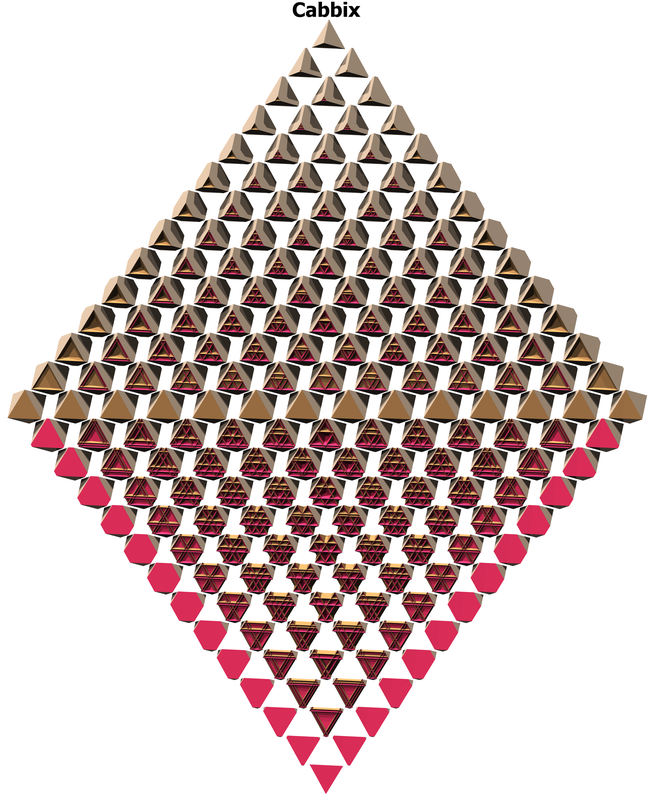 Its facets are 16 firps (red), 16 pinnips (purple), 5 firts (green), 16 srips (ice), and 16 sirdops (peach). It is pronounced as I-roll-own - sounds like a good name for a song. Dec. 17, 2013 part 2 - Gadinnert - Aka - great dispenteractirhombated32teron. Its symbol is x(x'x"x)o = xCo. It is a lone operative. 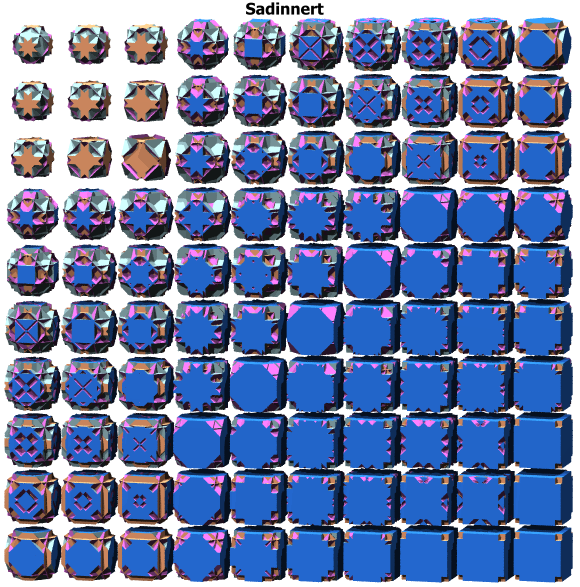 Its facets are 10 thatpaths (aqua), 10 thaquitoths (purple), 40 quithips (pink), and 32 grips (gold). In the big pic, you'll notice a detail in the lower right part (center of polyteron) that got missed in the small pic of sections - a place that has girco shaped sections. 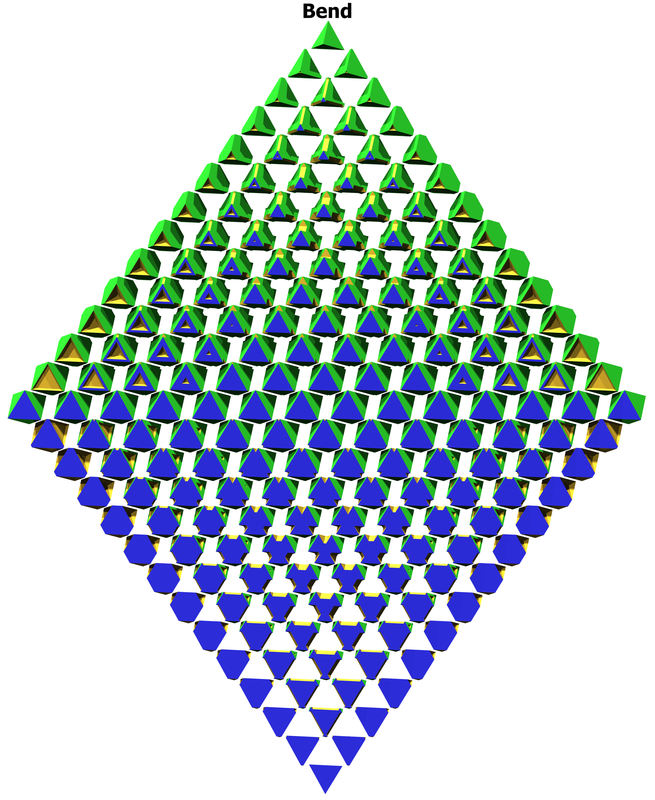 Dec. 17, 2013 part 1 - Sadinnert - Aka - small dispenteractirhombated32teron. Its symbol is o(x'x"x)x = oCx. It is a lone operative. 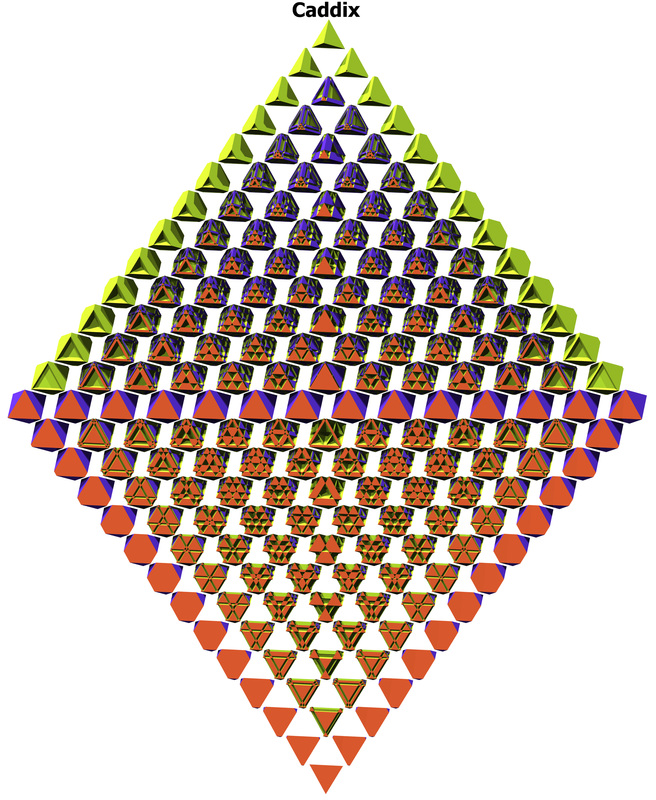 Its facets are 10 thaquitpaths (blue), 10 thatoths (peach), 40 ticcups (ice), and 32 grips (magenta). 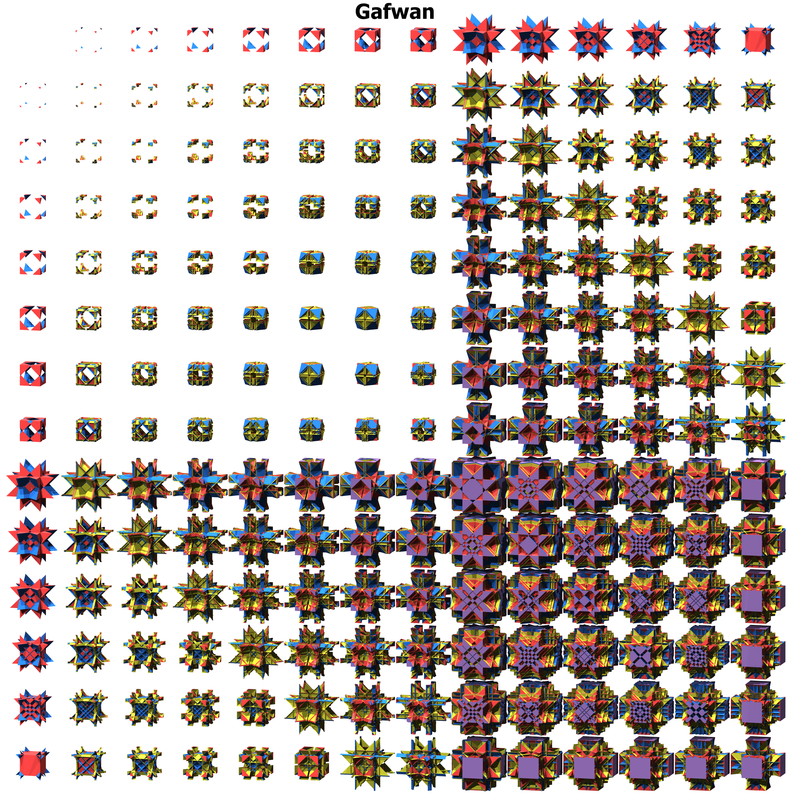 Dec. 13, 2013 part 2 - Gafwan - Aka - great facetosphenary penteract. It is a non-orientable member of the wavinant regiment. 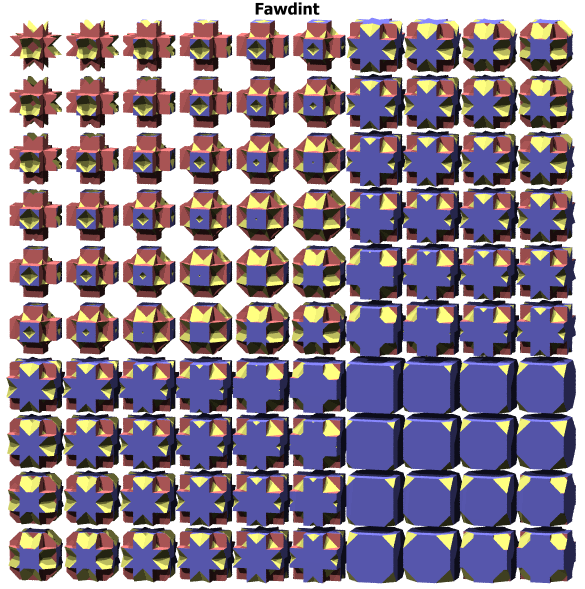 Its facets are 10 quitits (lavender), 40 quithips (red), 80 tistodips (yellow), and 80 tepes (blue). 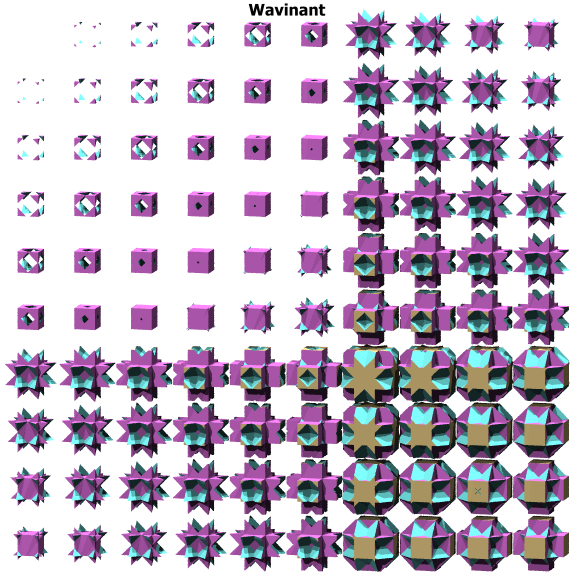 Dec. 13, 2013 part 1 - Wavinant - Aka - spenoverted penteractipenteracti32teron. Its symbol is (o'x"x)oo = Goo. Its regiment has 15 members. 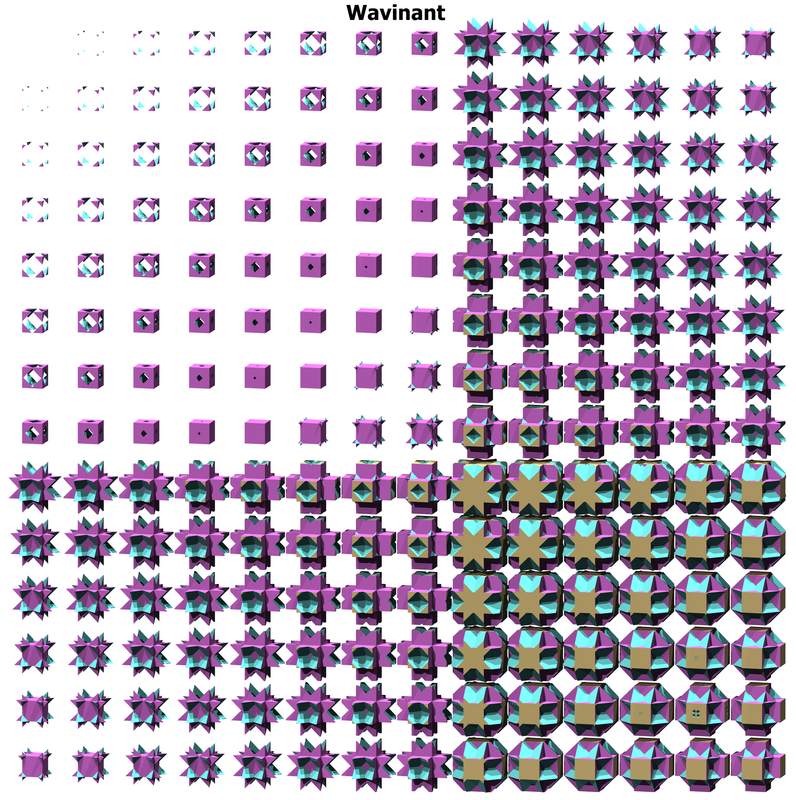 Its facets are 10 quitits (gold), 10 wavitoths (magenta), and 32 raps (cyan). Dec. 12, 2013 part 2 - Gatopin - Aka - great pteroprismated penteract. It is the "chosen one" in the fawdint regiment - AKA it is the non-orientable one with the least number of facet types which are also chosen ones or lone operatives - many "chosen" ones have choes in them, but this one doesn't. 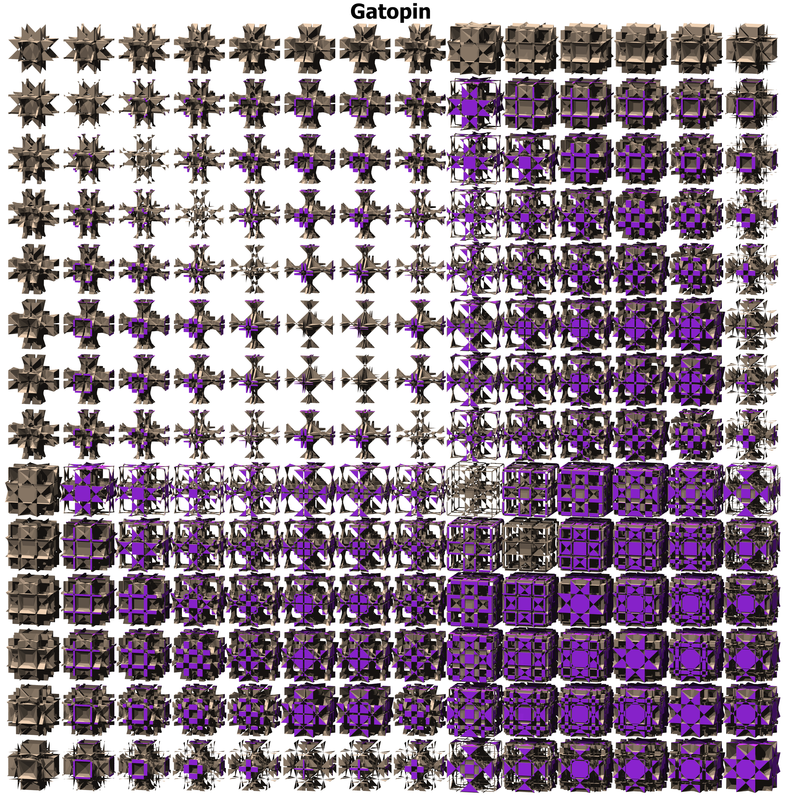 Its facets are 10 gaqripts (purple), and 40 grohps (light wood). Dec. 12, 2013 part 1 - Fawdint - Aka - frustospenary dispenteracti32teron. Its symbol is o(o'x"x)o = oGo. Its regiment has 37 members plus one fissary. 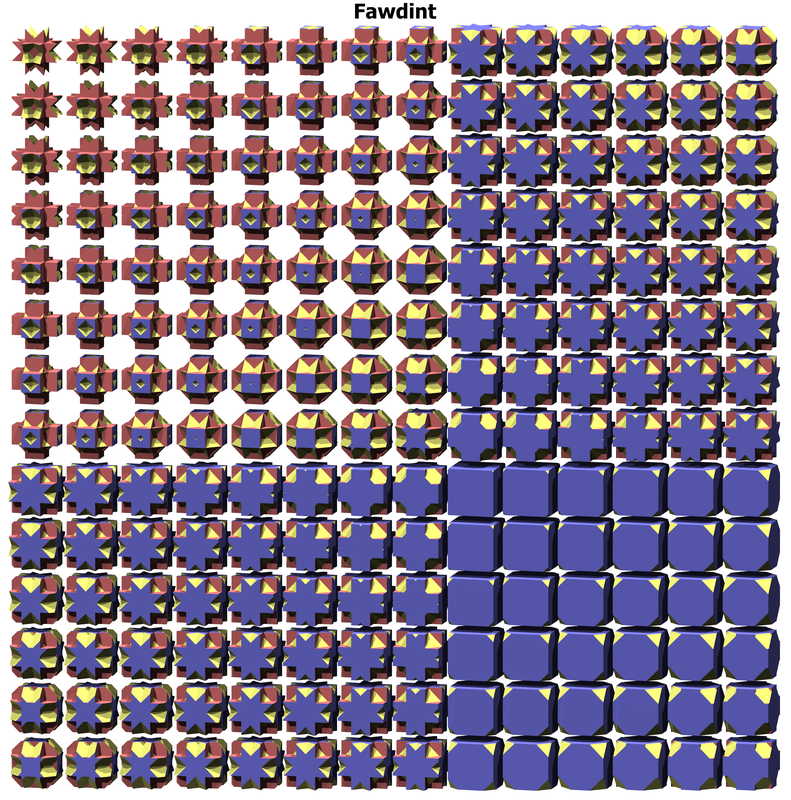 Its facets are 10 gittiths (red), 10 wavitoths (blue), and 32 raps (yellow). Dec. 9, 2013 part 3 - Gabdacan - Aka - great biprismatodiscellipenteract. 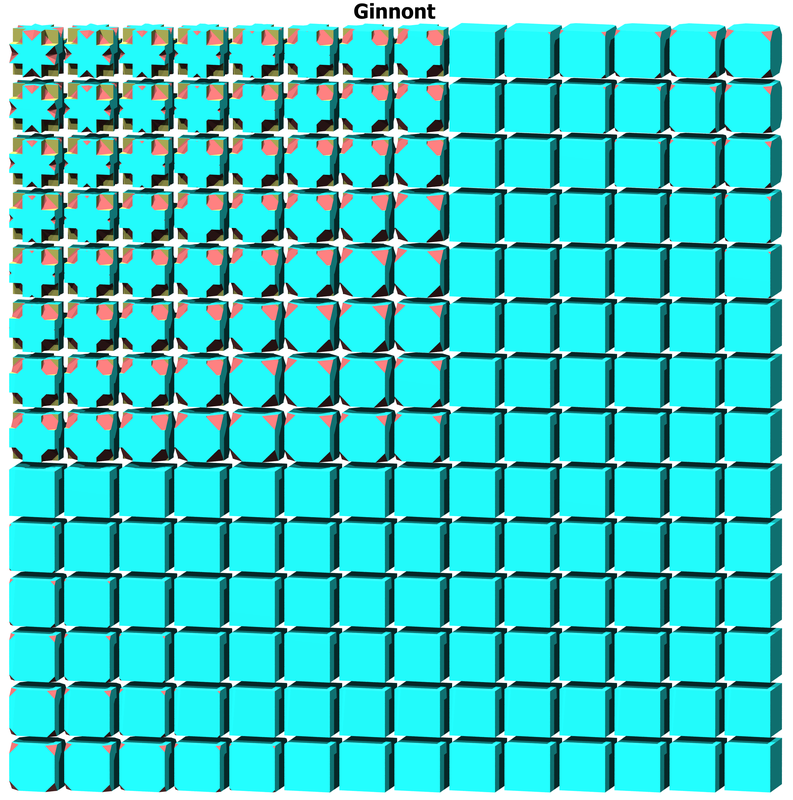 This one belongs to the ginnont regiment and is non-orientable. 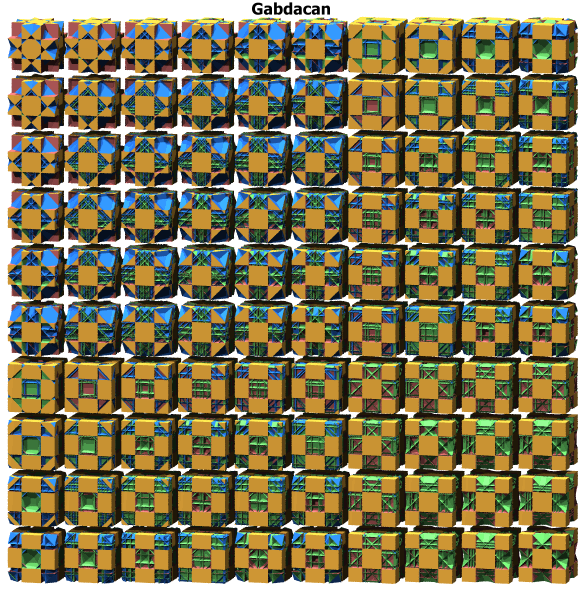 Its facets are 10 gittiths (golden), 40 tesses (red), 80 tisdips (green), and 80 tepes (blue). 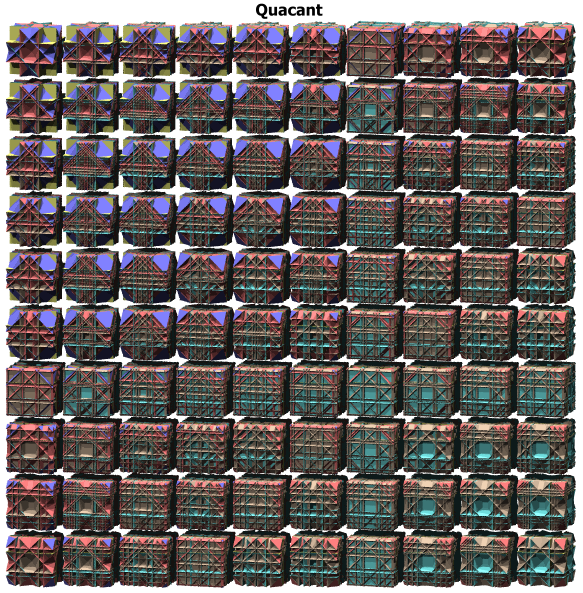 Dec. 9, 2013 part 2 - Quacant - Aka - quasicellated tesseracti32teron. Its symbol is xooo"x and it's in the ginnont regiment. 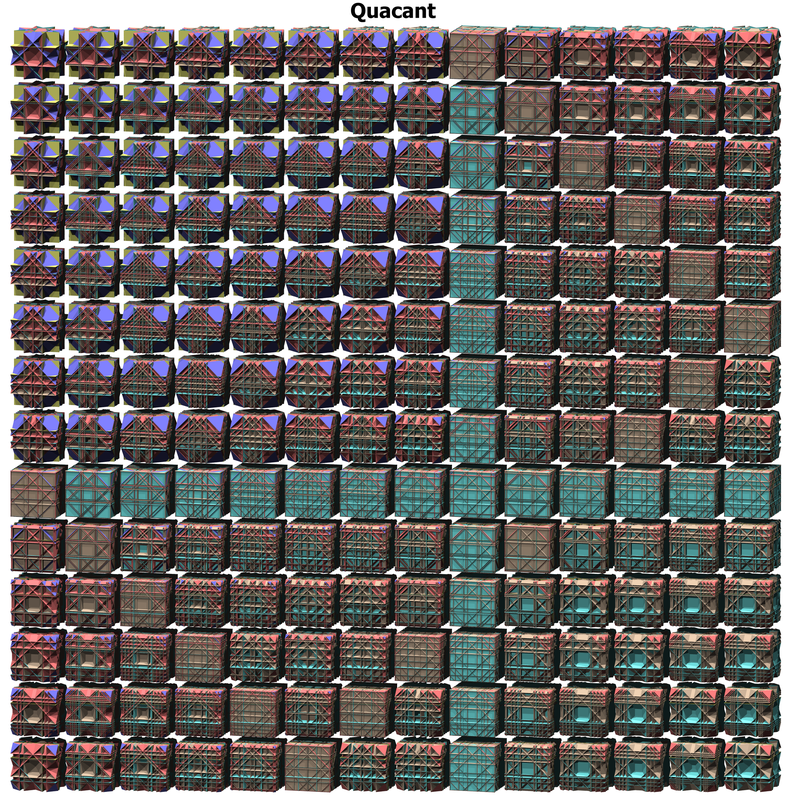 It is the 5-D version of querco (3-D) and quidpith (4-D). 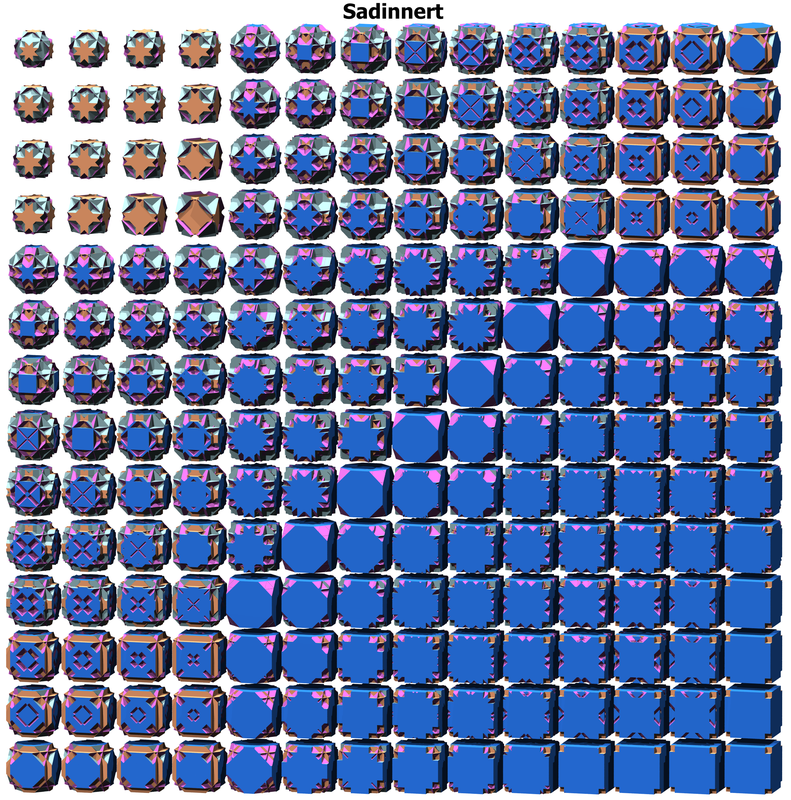 Its facets are 10 tesses (yellow), 40 tesses as cube prisms (cyan), 80 tisdips (light wood), 80 tepes (red), and 32 pens (blue). Dec. 9, 2013 part 1 - Ginnont - Aka - great penteractipenteracti32teron. Its symbol is oo(o'x"x) = ooG. 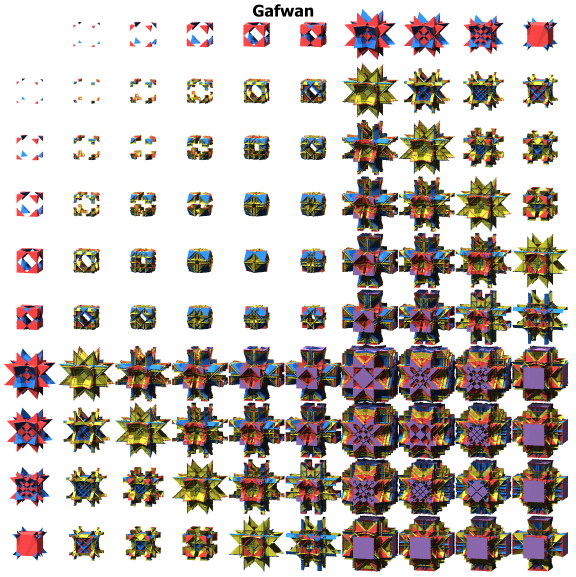 It is the 5-D version of gocco (3-D) and gittith (4-D). 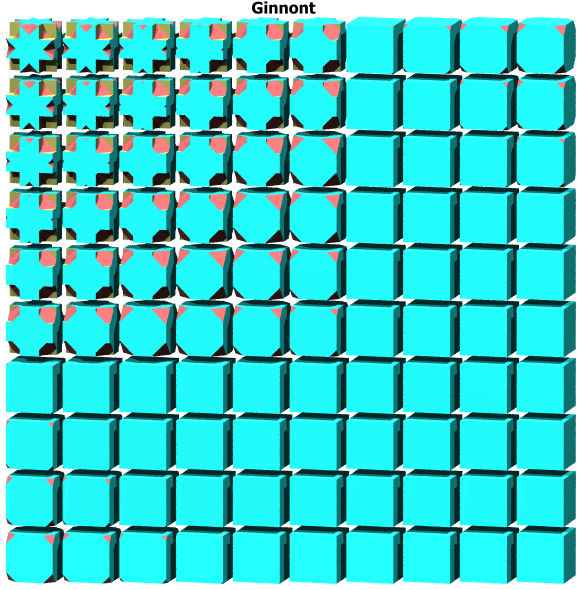 The ginnont regiment has 15 members. 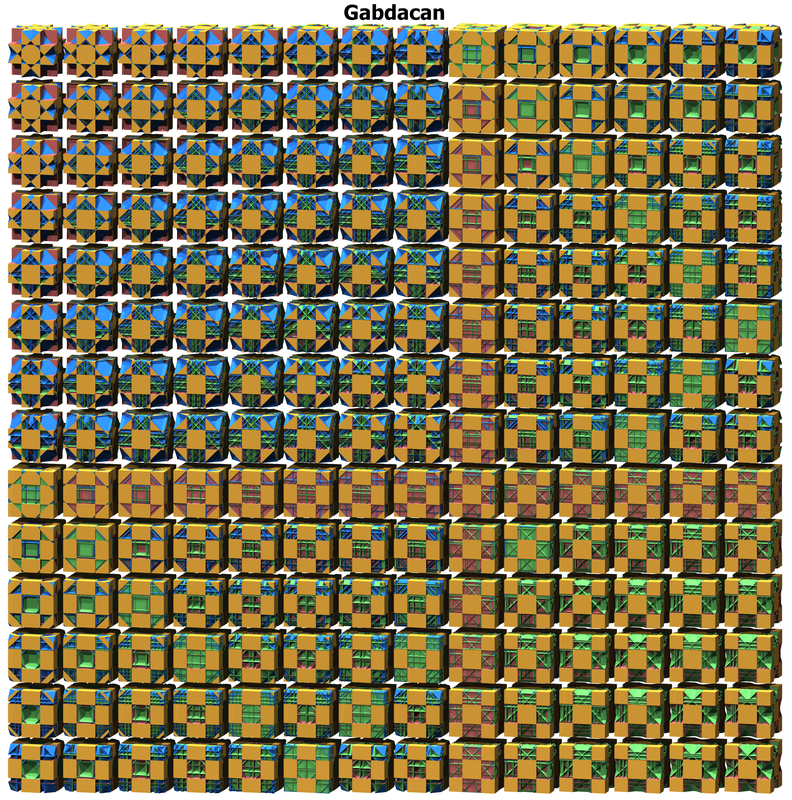 Its facets are 10 gittiths (cyan), 10 tesses (yellow), and 32 pens (red). Dec. 6, 2013 part 4 - Caddix - Aka - cellidishexateron. This one belongs to the dot regiment. 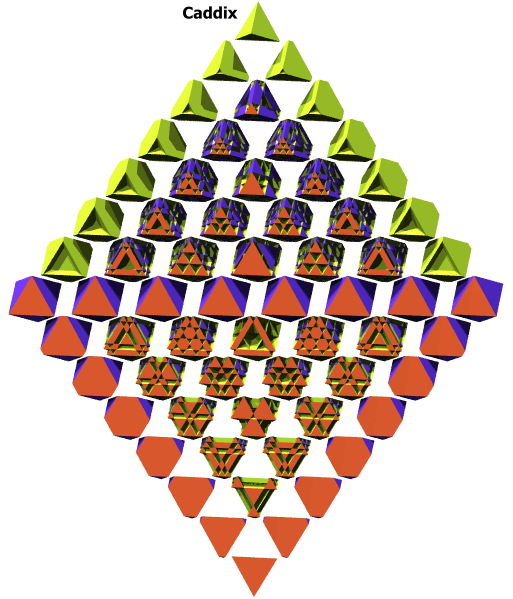 Its facets are 6 firps (purple), 6 pinnips (red-orange), and 15 opes (yellow-green). 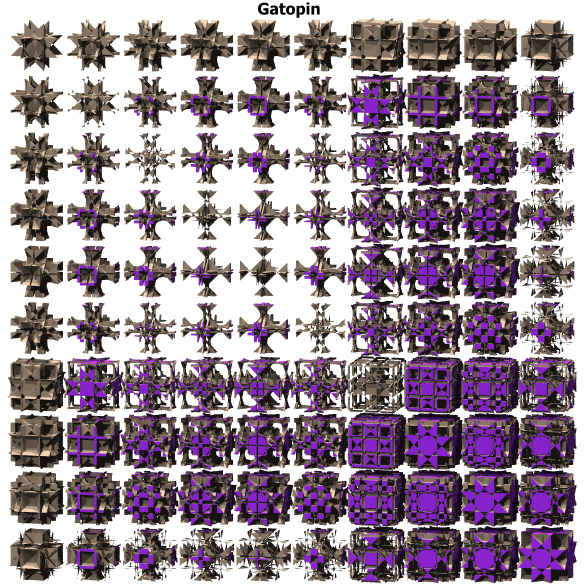 Dec. 6, 2013 part 3 - Cabbix - Aka - cellibiprismatohexateron. This one belongs to the dot regiment. 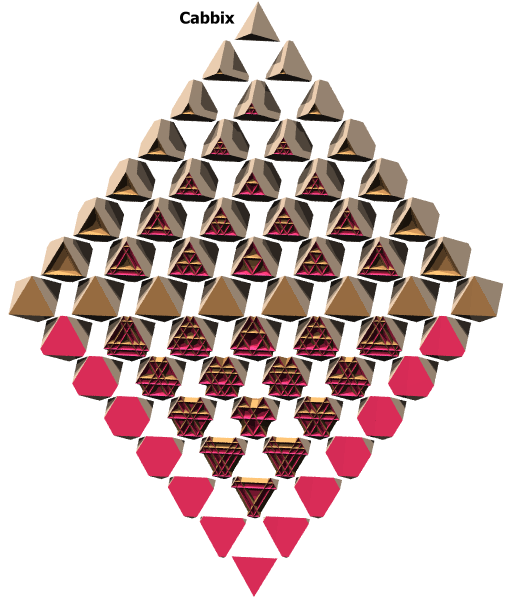 Its facets are 6 raps (light wood), 15 opes (hot pink), and 20 triddips (brown). Dec. 6, 2013 part 2 - Bend - Aka - biprismatointercepted dodecateron. This one belongs to the dot regiment. 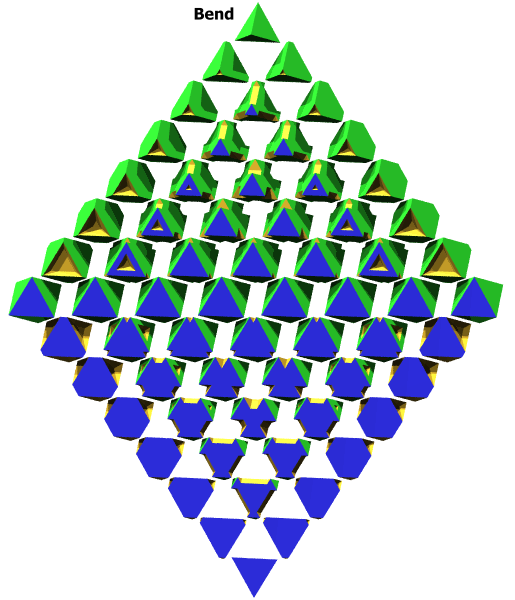 Its facets are 12 pinnips (green and blue) and 20 triddips (yellow). Dec. 6, 2013 part 1 - Dot - Aka - dodecateron. Its symbol is ooxoo and its regiment contains 5 members. It is convex and noble. 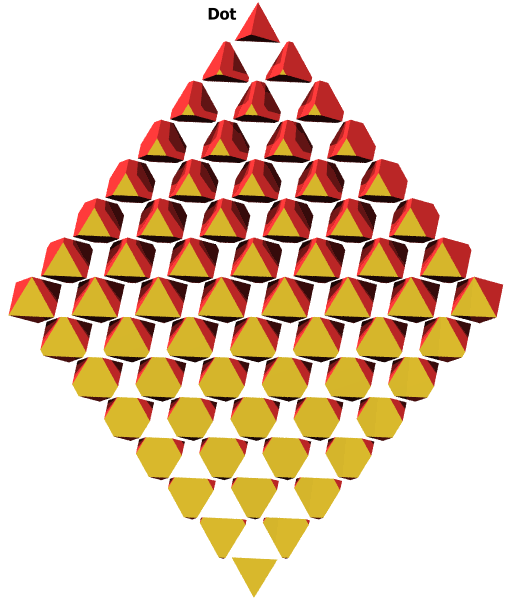 Its facets are 12 raps (red and yellow).